One of the most famous temple in India is Sri kalahasti Temple which is situated in South India and is told to be the site where Kannappa, one of the 63 Saivite Nayanars, was ready to give both his eyes to cover blood flow from the Shiva linga before the Lord Shiva stopped him and granted him moksha. In this way he blessed by Lord Shiva. Sri Kalahasteeswara Swamy Temple is very renouned as the Rahu-Kethu Kshetram.” Rahu Kethu Sarpa Dosha Nivarana Puja “ is occured in this temple. Worshipper who have Rahu-Ketu Doshas, SarpaDoshas and other problems like Unmarried, No Children, Health and more in their life’s shall perform the most effective and result oriented Pooja named as “Rahu-Ketu Sarpa Dosha Nivarana Puja” in this temple. It is firmly believed that after performing the puja whole heartedly, all the Doshas/problems in the life will be solved and desires take results. By this puja devote gets the blessings of Lord Shiva and his or her wishes and dreams come true. This temple is one of the five major Shiva temples (Pancha bhoota Sthalam), representing one of the five major elements – Wind. The other four temples are Chidambaram, Ekambareswara (Kanchipuram), Jambukeshwara (Thiruvanaikaval) and Tiruvannamalai. There is a lamp inside the inner sanctum that is amazingly continuously flickering despite the lack of air movement inside. The air-linga can be seen to move even when the priests close off the entrance to the main deity room, which does not have any windows .Surprisingly one can see the flames on several ghee lamps flicker as if blown by moving air. The linga is white and is considered Swayambhu, or self- created. The main linga is untouched by human hands, even by the priest. Abhisheka (bathing) is done by pouring a mixture of water, milk, camphor, and panchamrita. Sandal paste, flowers and the sacred thread are offered to the utsava-murti, not the main linga. This temple was built during the period of King Krishnadevaraya of Vijayanagar. A huge hundred pillared mantapam is another important feature of this shrine.This auspicious temple is located near the pilgrimage town of Tirupati and is visited by thousands of pilgrims. This temple is also associated with Rahu and Ketu. 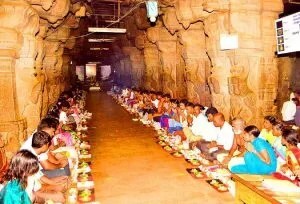 It is located 20 km from Tirupati Temple. Mahadeva is said to have given salvation to a spider, elephant and a serpent who were passionate devotees of the Shiva Lingam located here. The spider is said to have attained salvation in Kritayuga (the first of the four yugas in the Hindu tradition), while the elephant and the snake were devotees in Treta Yugam, the succeeding aeon. The elephant’s devotional outpouring was a source of disturbance to the serpent’s display of devotion and vice versa, resulting in animosity between the two, until Shiva’s intercession gave both the devotees their salvation. A hunter named KannappaNayanaar is said to have been a great devotee of Kalahasteeswarar. Legend has it that he offered his own eyes to the Shivalingam, and for this reason earned the name. The hunter Kannappan (his original name being Thinnan), and the distinction of having his statue adorn the sanctum. Srikalahasti is the place where Spider, Elephant and Serpent attained salvation due to the benevolence of Lord Siva. The features of Rahu and Ketu with a snakes head and a human body, and Ketu with a human head and a snake’s body are considered as celestial bodies – shadow planets, or the node positions at which eclipses are caused. Rahu is the ascending node while Ketu is the descending node. Thousands of pilgrims visits the temple to have darshan of the almighty Sri Kalahasteeswara and Sri Gnanaprasunambika Devi. 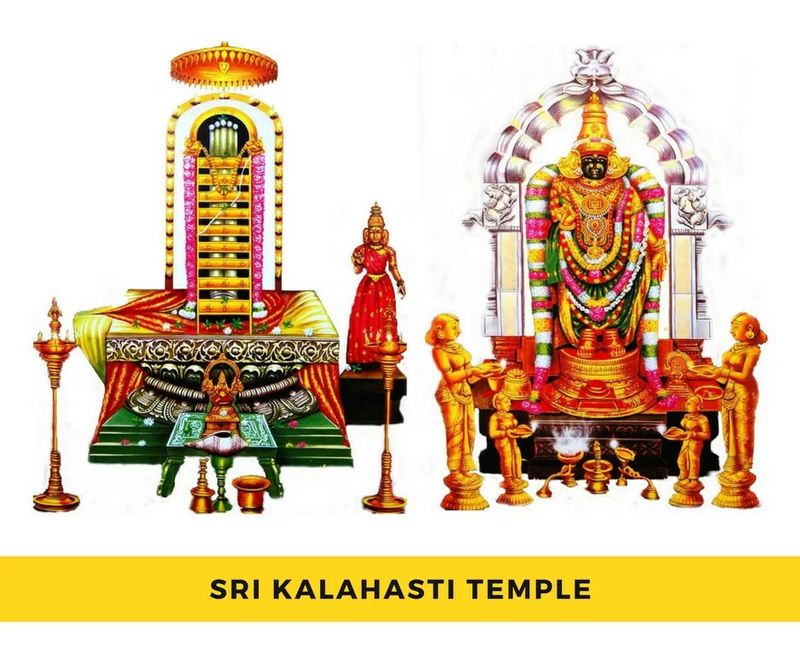 Sri Kalahasteeswara showers grace to wipe out the sins and obstacles of worshipers. The devotees who Worship Sri Kalahasteeswara get results in dispelling all worldly miseries and attaining marvelous spiritual happiness and joy. Goddess Gnanaprasunambika Devi received the Panchakshara mantra from the Lord Himself. The Goddess arrived at the place and started her self –mortification here. The Rahu-ketu sarpa dosha puja is a frequently performed very activity. You can book the pooja only if you are physically present at the temple. And your pooja ticket must be used up on that day itself .No advance booking by telephone or money order is allowed. If you are efficient that the pooja be conducted during Rahukalam on Tuesday (for maximum effect) be at the temple at least an hour or two before the start of Rahukalam and buy your ticket from the appropriate counter located within the temple walls. Astrology regards Rahu and Ketu as the only two “planets” which has varying degrees of malefic ( some benefic effect is also present) effects on ALL human beings. Which means that the Nivaranapooja at Kalahasti (for removing the ill effects of Rahu and Ketu) is good for all human beings. A good astrologer may give guidance to you to select the appropriate day and time to visit the temple. Hopefully he may select a week day when no festival is being conducted (as the crowd may be unmanageable at other times). Also check and see if any visit by high profile VIPs are scheduled. Temple entry may be temporarily barred during such visits for security reasons. Along with the ticket, you are also given all the materials that are needed for the pooja. Do not purchase pooja materials from the stalls outside the temple. This ticket also give you the scope to an exclusive darshan (glimpse) and archana (special pooja) of the main deities within the temple. Keep this ticket carefully and Don’t lose track . Also keep track of the materials given to you for the pooja. And don’t hesitate to ask for clarifications when in doubt. The pooja itself is not a fire ceremony. While the priest chants the mantras you are only expected to carefully drop first some flowers (little by little) and then coloured ash on the metal representations of Rahu and Ketu. (After the pooja, these metal representations MUST be deposited in a special box at the temple. Though there is a dress code for the pooja, the temple does not seem to be implementing it strictly. But it is good if gents wear dhoti and angavastram. Light a lamp in front of the Goddess every Tuesday and Friday evening and experience the positive effects in your life. The temple can give you lot of benefits in your personal life only if you pray with a pure heart and 100% faith and devotion and dedication. Kalasarpa dosha pooja has brought lot of warring couples together. Do perform the pooja of shani bhagwan inside the temple. The pathalavinayaka temple located underground within the premises is a beautiful temple. The Lord Ganesha here is very powerful and if you notice, his face [especially eyes] is very similar to an elephant. Those who are obese are advised not to venture out ,others can definitely try. It is a marvelous experience, worth it. Do not miss the frame of Lord Dakshinamoorthy after the darshan is over. This Lord is very powerful for those who are looking for a job or trying to fulfill their ambitions, improve their career prospects. When you walk around the temple, you will find lot of inscriptions and also understand the rich cultural heritage of South India. The idols of 63 nayanmars within the temple is a disquisition to watch. Afte rcomplete the darshan, when you come out of the temple, you can buy the lamp and ghee near the entrance and light the lamp there itself. Milk for abhisekha is also available in the temple at a price. The darshan of Lord Shiva[Sri Kalahasteeswarar and Lord Parvathi (Gnanaprasunambika Devi) is an experience only those who have a spiritual mind. Only they can enjoy and relish. Months after the darshan you will still experience the bliss. Put off your chappals and slippers in the vehicle itself. If you perform the pooja of kala sarpadoshapooja, you are advised to directly return back home after the pooja to benefit from the positive vibrations that result from the pooja. At the end, what matters is faith, trust. So, visit the place with an open frame of mind and be ready to soak in the spiritual experience. Srikalahasti is a blissful place which will keep on beckoning you forever.